If you’ve ever heard of the Fall Toy Preview, then you probably know that it’s one of the biggest toy conventions of the year where hundreds of toy manufacturers privately show their newest product lines to long lead buyers like Target, Costco, and Walmart. The 2012 FTP took place in Dallas last week and to our pleasant surprise, one of our products was chosen to be featured on a Fox segment called “Save Me Steve”, airing on Fox affiliates throughout the country. 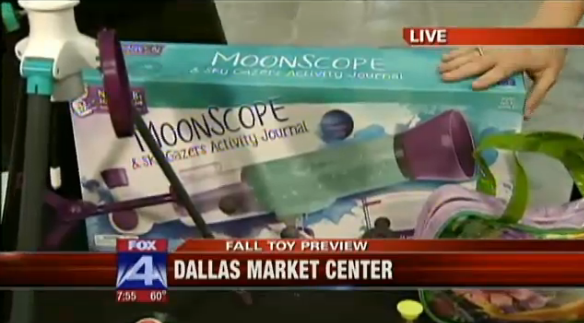 Our very own Nancy B’s Science Club MoonScope was one of a handful of toys chosen for this feature by the Toy Industry Association. This is great news for us, and we couldn’t be happier! If you missed the segment and you want to get a sneak peek of one of our 2013 lines, check out the video through the link below.